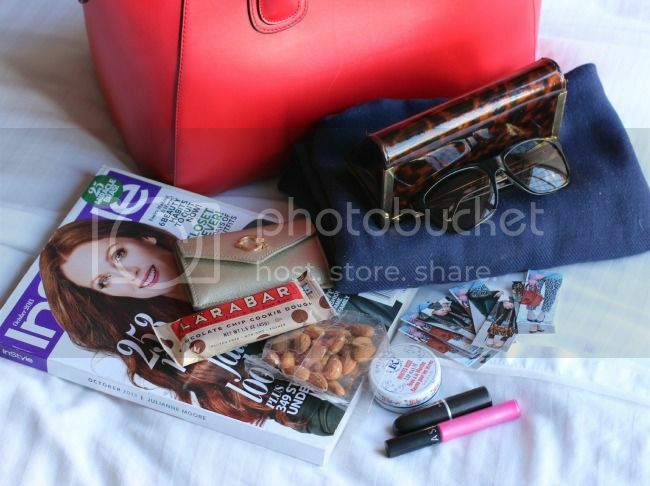 I'm still prepping all my St. Louis Fashion Week posts so in the meantime I thought I'd do a "what's in my bag" post. When I travel I make sure I have the basics I carry around on the daily and also add some travel essentials: snacks, reading material and a blanket in case the plane is cold. I know, you're probably thinking I'm crazy for toting around a blanket in my bag but hear me out on this one. I randomly kept the blanket from a past United flight and discovered it folds down pretty compactly making it perfect for those times it's a little too chilly on the plane. Other daily essentials I tote around: business cards, lip stain, lip balm, sunglasses and wallet. Throw in a bottle of water and you're all ready to jet set. What do you keep in your bag when you travel? Anything I'm missing? That's a really nice structured bag.